In last week's midterm elections, Alaskans approved Ballot Measure 2 by a margin of 52 to 48 percent, making theirs the fourth US state in two years to legalize recreational cannabis use. Oregon became the third earlier Tuesday night, joining Colorado and Washington, states that legalized in 2012. Add in marijuana's quasi-legal status in California, and Alaska's vote brought legal weed to the entire West Coast of the United States (perhaps to the chagrin of oft-busted bud growers in Canada's B.C.). In an age of near-universal public support for some kind of cannabis legalization, it may not seem very surprising that Alaskans voted to legalize weed by a fairly wide margin. I mean, the stuff had pretty much been legal in the country's northernmost reaches since 1975, when the Alaskan Supreme Court ruled that personal cultivation and consumption of marijuana in the home was protected under the state constitution's right-to-privacy article . Under that ruling - which made marijuana laws in staunchly conservative Alaska the most liberal in the country by far - Alaskans could possess up to four ounces of cannabis and grow up to 25 plants in their home. When that ruling was challenged by a 1991 initiative that re-criminalized cannabis, barely anything changed . State troopers refused to enforce it, with some even agreeing that they'd rather try to take a man's gun than his stash of weed. Yes, you read that right: In Alaska, a state where people love (and actually need) their guns more than they do in Texas, state troopers in the 1990s preferred grabbing guns instead of ganja. 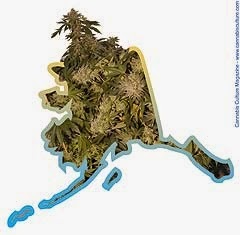 Alaskans further undermined the '91 law when they legalized medical cannabis via a ballot initiative in 1998. Alaska is a cold, unforgiving place, populated by people who, as their state constitution's privacy article suggests, value their individual liberties above most everything else. It's safe to say that telling people what they can and cannot do in a state where nature's laws undoubtedly govern more effectively than man's has never been popular. 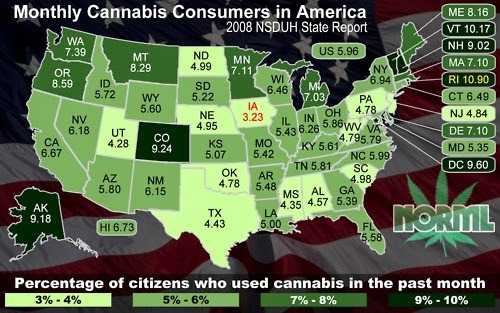 In such a harsh environment marked by half-years of total darkness, it's also completely understandable why Alaskans have some of the highest rates of marijuana use in the country (see footnote #1 and the map to the right, where as of 2008 the percentage of monthly marijuana users in Alaska was surpassed only in three other states and Washington, D.C.). But when we discuss Alaskans' historic relationship with cannabis in a purely political or social context, we gloss over one of the most fascinating and important elements of the story: namely, how did a plant that thrives in the most sun-drenched parts of the world come to find a happy home so close to the Arctic Circle? From the late nineteenth century to about the mid-1960s, most of the marijuana plants brought to or grown in the United States were tropically adapted strains of cannabis. After Britain outlawed slavery in its Caribbean colonies in the 1830s, indentured servants from India replaced African slaves and brought their ganja seeds to a completely new part of the world. From the Caribbean, tropical Cannabis strains spread to the Central American mainland, to Mexico, and in the early 1900s, to the southwestern United States. The pot that Allen Ginsberg and other beats smoked in the 1950s came from New-World variations of the tropically adapted Indian plants brought from the Old World more than a century earlier. On account of its plentiful sunshine and its networks of plumbing and irrigation that brought water to desert cities like L.A., California was a hotbed of outdoor marijuana cultivation by the 1960s. Then, in the 1970s, growing took off in the remote regions of northern California, as Back-to-the-Landers began planting cannabis in gardens on homesteads or communes. In Oregon and Washington, meanwhile, growers had been trying their luck since at least the 1930s, with moderate success in some places. But as Americans took tropically adapted cannabis farther north, they began to encounter difficulties. In colder regions of the Pacific Northwest, the plants either wouldn't flower, or their buds simply didn't pack the punch of those in sunnier climes farther south. These tropical plants posed another problem that was not unique to growers in the northwest: they grew tall. Really tall. 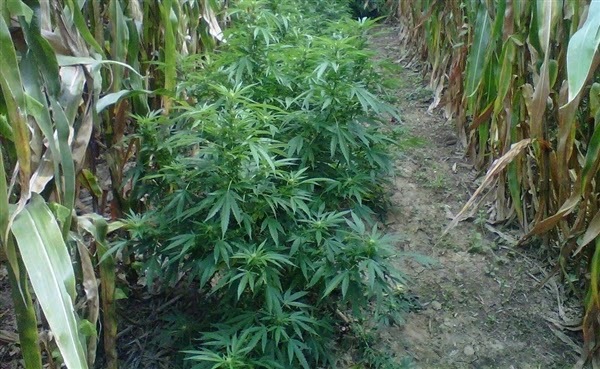 Some strains grew to heights of fifteen feet - certainly not the ideal size for an illegal crop. Luckily for American growers, humans and nature had already developed a solution to these problems halfway around the world. In Afghanistan and Pakistan during the 1970s, traveling hippies found a shorter, darker, and more potent variety of marijuana that had adapted for centuries to life in the cold Hindu Kush mountains. Afghani strains not only kept a more compact habit and matured faster, but they also produced a higher amount of THC (tetrahydrocannabinol, the primary psychoactive compound in marijuana). For the plants, the resin held in moisture and blocked harmful UV rays in a dry and high-altitude environment. For cannabis cultivators and consumers in the states, this would translate to higher profits and higher highs. Back in the United States, the Cold War was doing its own part to spread different cannabis strains across North America. Veterans from the American War in Vietnam brought home tropically adapted Thai and Vietnamese strains, while draft dodgers from California and elsewhere took their Mexican or Colombian strains across the northern border into British Columbia. In the Pacific Northwest during the 1970s and '80s, growers bred the newly introduced Afghani plants with their tropically adapted cousins, further enhancing their THC content and creating plants that would flower outdoors as far north as Alaska. 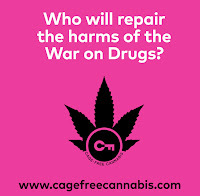 Also during the 1980s, the Reagan Administration launched a renewed campaign against marijuana growers, forcing them to retreat indoors under the glow of halide lights, a relatively recent invention (they were developed in the 1960s and were becoming relatively affordable at just the right time for indoor marijuana growers). So, beginning as early as 1970, Alaskans had the biological and technological power to flower potent strains of cannabis in their home state. The individual freedom to smoke pot seems to have fit with Alaskans' preference for hands-off government and, like booze, helped raise the spirits of people who lived in a dark and freezing climate for most of the year. 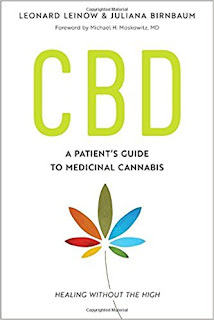 But unlike booze, Cannabis raised spirits without raising or exacerbating the horrible social costs - addiction, poisoning, and domestic abuse - that accompany widespread alcohol use in the same state. Evidence of pot's widespread appeal in Alaska exists in the breakdown of votes cast for the 2014 measure; unlike rural constituencies in other states that recently legalized, including Colorado and Washington, rural Alaskans showed relatively strong support for legal marijuana. So what kinds of strains do they grow out on the Last Frontier? Most of today's popular marijuana strains were developed in the 1970s and 1980s in the Pacific Northwest or in Amsterdam, but because of the sheer diversity and complexity of modern marijuana - worldwide, there are some 2,000 strains and counting - it's hard to pinpoint their true geographic origin. Strain names aren't much help either; the "Alaskan Ice" variety, for example, was not originally grown in Alaska and actually has more tropical genes. However, Alaskans have come up with at least one strain of their own, "Matanuska Thunderfuck" (or, the less profane "Matanuska Tundra," close-up shown to the right). 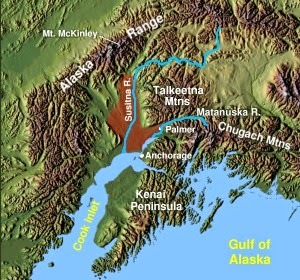 This hybrid strain was developed in southern Alaska's Matanuska-Susitna Valley (highlighted in red below). So to recap: the introduction of faster-maturing cannabis strains adapted to colder climates in the 1970s, combined with the widespread availability of halide light technology and the crackdown on outdoor growth in the 1980s, is why Alaskans can now enjoy both their own adapted marijuana strains, as well as other strains from the around the world. Importantly, the extreme environments that many Alaskans endure and prosper in for most of the year has fostered a fierce libertarian disposition that compels its population to reject any kind of regulation of personal freedoms, including what kinds of drugs it chooses to take or plants it chooses to grow. One Alaskan summed this up quite nicely in 1991, telling a reporter that "As long as I live in this state I have a right to keep a little reefer by the woodstove, and no one's going to take it from me." That anonymous man was not alone then, and the results of the 2014 primary election show that he is far from alone now. 1. Christopher Ingraham, "Alaska legalized weed 39 years ago. Wait, what?" Washington Post, September 25, 2014. 2. Timothy Egan, "Sitka Journal; Life, Liberty, and Maybe Marijuana," New York Times, February 5, 1991.